On July 20, the town of Union, N.Y., along with other Broome County highway superintendents, held a press conference to show appreciation to New York State Sen. Fred Akshar for his role in procuring shared services equipment for Broome County and to introduce the newly acquired machines to the taxpayers of the county. Akshar worked closely with local highway superintendents from across Broome County to procure $361,176 in funding for new road repair equipment to be shared by local municipalities throughout Broome County. The new equipment will help local municipalities complete essential infrastructure projects, to repair and maintain local roadways, large culverts and heavy rock work without much of the cost being passed on to local taxpayers by way of local property tax increases. The $361,176 will cover the purchase of a Caterpillar 320 excavator, a Weiler road widener and a Caterpillar CW16 rubber-tired asphalt compactor. The funding will be allocated to the town of Union through State and Municipal Facilities Program of the Dormitory Authority of the State of New York (DASNY). The three machines that were purchased were all spec'd specifically in the grant that was applied for from DASNY and the actual machines were purchased off the NYS OGS NJPA contract. “The highway superintendents from across the county met to decide what brands of equipment to buy and we decided to go with Caterpillar machines and Caterpillar supported machines because of successes that we have had with Milton Cat and Caterpillar in the past,” said Chet Kupiec, highway superintendent of the town of Union. “The Caterpillar 320 is a great example of a machine that most townships would not be able to budget for and they would end up hiring outside contractors whenever the need would arise,” said Kupiec. “The Cat 320 gives us the ability to work and install large rip rap rock when necessary on the scope of the sizes of large culvert replacement jobs that we can do on our own in all parts of Broome County. “The Caterpillar 320 excavator is referred to as 'the next generation' of 20-ton sized excavators from Caterpillar. There were several features involved that were important to us — fuel efficiency has been increased by 25 percent. A combination of lowering the machine's rpm's yet increasing the size of its hydraulic pumps achieved this. “The feature that really excited us is the Caterpillar E-fence system. This system allows the operator to set limits on how the machine functions with a different set of guidelines for each situation. For instance, if we know there is a cable three feet down we can set the excavator to never dig deeper than two and a half feet. If there are utility lines ten feet overhead, we set the boom to never raiser higher than nine feet six inches. Additionally, we can set swing parameters that would dictate how far the boom can swing to the left or to the right so that it cannot swing out into traffic. 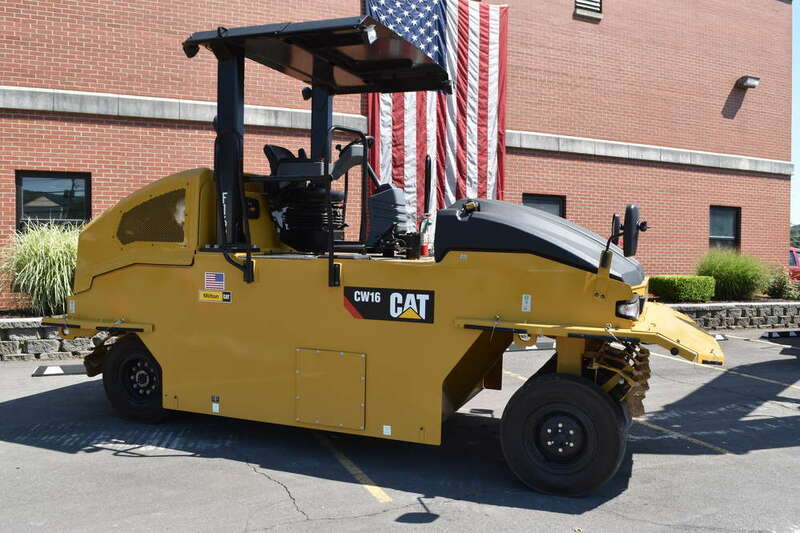 The Caterpillar CW16 rubber-tired asphalt compactor is specifically designed for compacting oil and stone, which is widely used for road maintenance throughout the county. The Weiler road widener also has a very specific application, according to Kupiec. The town of Union town board fronted the funding for the three pieces of equipment until being reimbursed by New York State and will be storing and maintaining the equipment at the town, for all municipalities to use in Broome County. As a part of this agreement the town of Union also will be supplying a tractor and trailer for delivery of the machines to its fellow municipalities as well as a trained operator if necessary. The costs involved in the service, maintenance and delivery of these machines is charged back to and collected from the municipality using the equipment, but it is still substantially less than renting the machine or hiring an outside contractor, according to Kupiec. You can also view previous issues of Superintendent's Profile.